One of the most memorable meals I’ve had in Mexico City was at Quintonil in the city’s posh Polanco district. The cooking there combined the saturated flavors and colors of Mexican cookery with the ingredients and sentiments of cultures abroad. In particular, I remember blushing slices of ahi tuna with warm pico de gallo and an inky sauce made from pig ears, and a bowl of Iberian pork jowl marinated in achiote with beans and pickled onions (see all of the photos from that meal here). 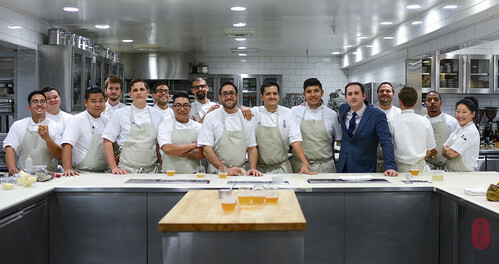 Not having had the chance to return to Quintonil since, I was particularly excited to see chef Jorge Vallejo on the list of guest chefs for this year’s Twelve Days of Christmas, where he was the fourth to cook with Christopher Kostow at The Restaurant at Meadowood. 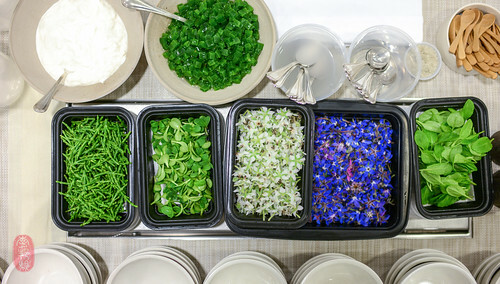 Vallejo brought his colorful cuisine to The Restaurant at Meadowood. 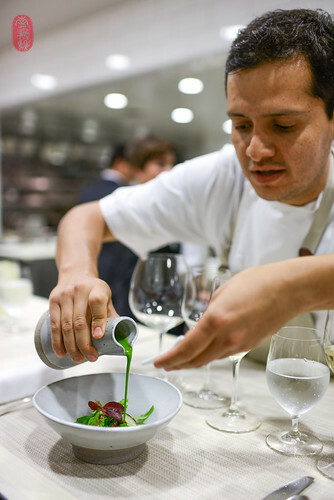 He collected a rainbow of herbs and blossoms and put them in a garlicky bowl of nopale ceviche with milky burrata. This was a terrific canapé that he served at the pre-dinner reception. In another bowl, he blanketed tomatoes and garden herbs with a generous grating of cotija cheese. Over this he poured a warm, emerald green cactus sauce brightened with the fragrance of cilantro and lime. There were some dishes that were more recognizable to me as Mexican, like a crab tostada with avocado that Vallejo served as a canapé, or a salbute (a masa tortilla fried until puffed and crispy) filled with wild mushrooms and creamy escamoles (ant eggs). Perhaps my favorite dish from Vallejo at this dinner was his chicken in almondrado. The chicken had been baked in bread, keeping it especially moist and juicy. It was brushed with schmaltz, and served with an incredible mole that was sweetened with raisins and thickened with almonds. 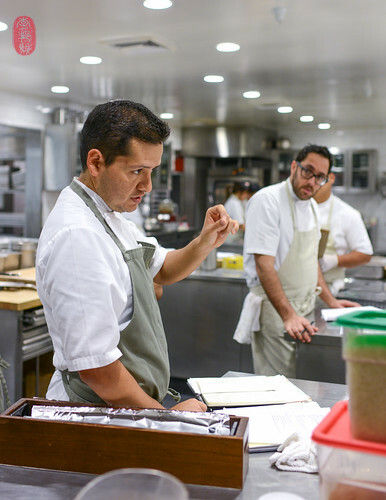 In the spirit of collaboration, Kostow worked to reflect a bit of Vallejo’s Mexican spirit in his cooking. 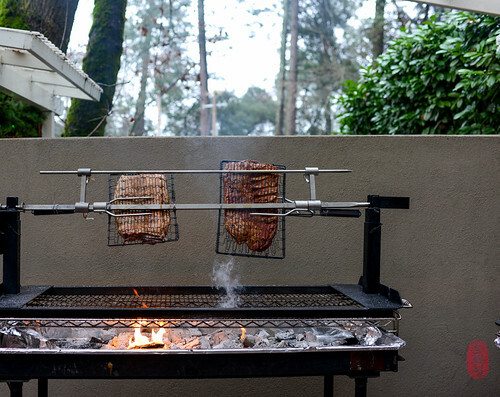 In the afternoon, Kostow roasted slabs of pork belly on a rotisserie spit set up outside the restaurant. This pork “rostizado” was served with leeks and wild mushrooms. Kostow also served tripe with a sauce of clam, chorizo, and celery. Cheesecake is one of the last things I’d normally order voluntarily. But the queso fresco cake that Kostow served this night, with a crust made from ground peanuts and topped with preserved cherries and a raspado (shaved ice, like granité) of the preserved cherry juice spiked with mezcal, was fantastic. Below, you’ll find the menu from the fourth night of the Twelve Days of Christmas featuring Jorge Vallejo. 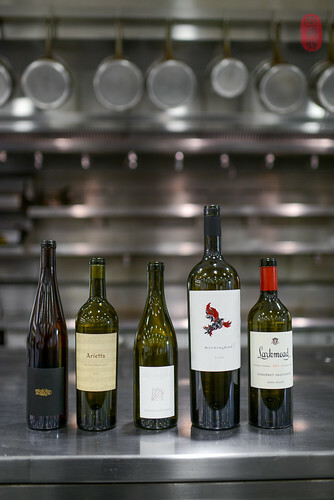 To see all of the photos from this dinner, CLICK HERE. Peanut, raspado of preserved cherries. Grapes, rhubarb, cream lemongrass, and lemon thyme. Photos: The colorful mise en place for Vallejo’s nopale ceviche canapé; Jorge Vallejo tableside; pork belly on the spit for pork “rostizado;” Jorge Vallejo, with Christopher Kostow, at kitchen line-up; wine pairings; and Jorge Vallejo, with Jorge Lara Goribo, Christopher Kostow, and the kitchen staff of The Restaurant at Meadowood. ~ by ulterior epicure on December 16, 2015.